Rustic pavilion at Poets' Walk, Scenic Hudson's best-known park. Photo: Robert Rodriguez, Jr.
Scenic Hudson parks are free and open to the public all year round. Dogs are welcome (on leash) at all Scenic Hudson parks except Scenic Hudson Park at Irvington. Many of the parks have some sections that are accessible for the mobility impaired. 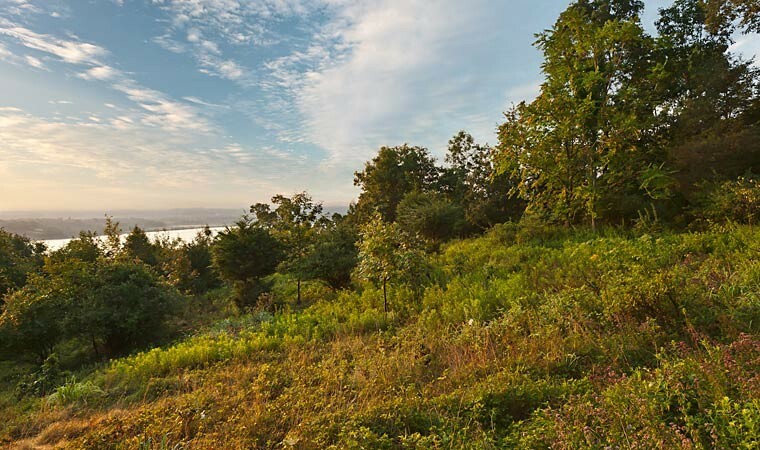 Before you visit, check out Scenichudson.org for further details and information on what activities are available at the parks. The parks are unstaffed. 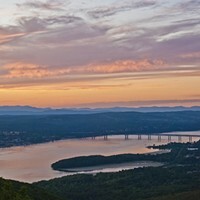 Scenic Hudson encourages people to volunteer to help maintain its parks. 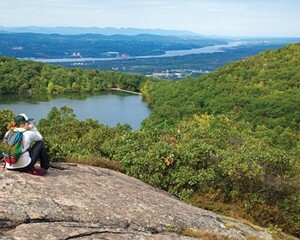 Below are descriptions of three parks in the Mid-Hudson region that highlight multiple aspects of the organization’s efforts at providing access to the outdoors. 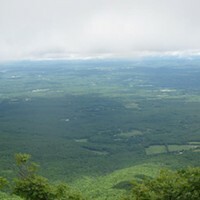 In an area of Ulster county populated by many Scenic Hudson sites—Esopus Meadows Preserve, Shaupeneak Ridge, Black Creek Preserve—High Banks Preserve opened two years ago on bluffs overlooking the Hudson River. It’s named after the English translation of “Esopus,” a Native Americans term for the area. 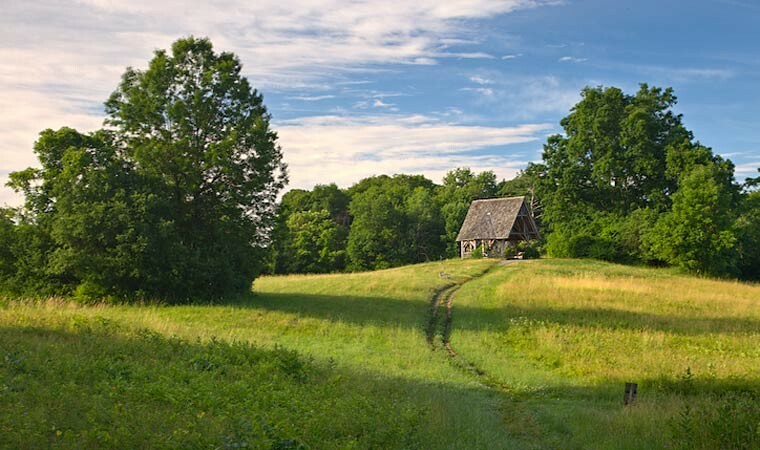 A steep trail climbs 200 feet to the upper parkland with former carriage roads that meander through wildflower-filled meadows and hardwood forests to Esopus Lake, as well as a 110-foot boardwalk spanning a wetland. The site is a former summer camp for boys, which pitching legend Sandy Koufax attended. In the 1940s, the site was also considered as a possible home for the United Nations. Activities: Walking, hiking, picnicking, wildlife watching, wheelchair accessible. Established in 1818 to supply the US government with artillery, the ironworks employed hundreds of workers who produced some of America's first steam engines, locomotives, and ironclad ships. After foundry operations ceased in 1911, nature slowly reclaimed the land. Trails follow old rail beds and pass the remains of foundry structures that led to the preserve's inclusion. The site, on the National Register of Historic Places, includes multiple interpretive features—including a full-scale sculptural model of the 36-foot water wheel that powered the boring mill. 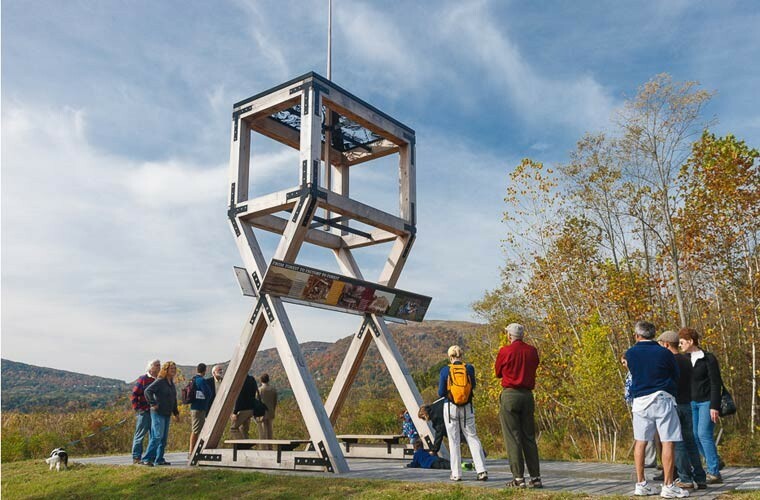 Two miles of additional trails pass more foundry ruins within the preserve before taking visitors to related sites in Cold Spring, including Scenic Hudson's Foundry Dock Park and the Chapel Restoration. A mobile-enabled audiovisual tour (Foundrytour.org) allows visitors to experience the sights and sounds of a 19th-century ironworks as they roam the preserve. Replica of the historic gun platform at West Point Foundry Preserve. 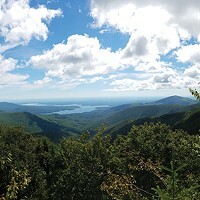 Photo: Robert Rodriguez, Jr.
There’s no denying it—the trail is straight up from the parking lot to the summit of Mount Beacon (1,611’), so named for its role in the American Revolution as a signal fire outpost to warn of British troop movements. The hike begins on a staircase following the course of the Beacon Incline Railway, once the world's steepest funicular and one of the Hudson Valley's prime tourist attractions. (The Beacon Incline Railway Restoration Society is working to return the ride, destroyed in a 1983 fire, to its former glory.) 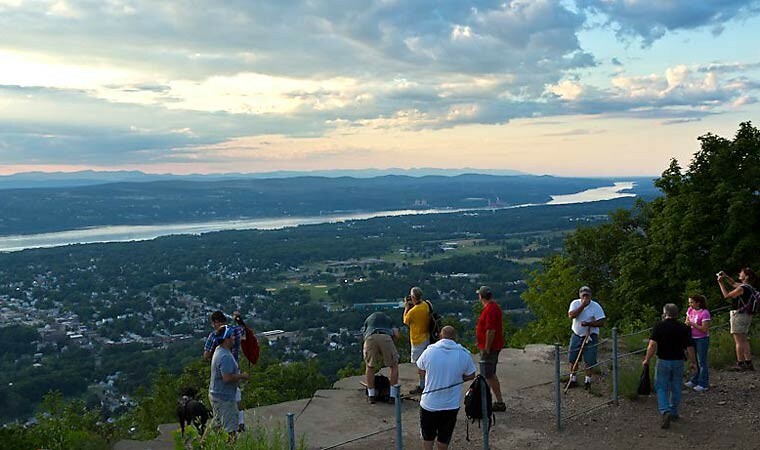 Keep plugging on toward the summit where you’ll find sublime vistas stretching from the Hudson Highlands to the Catskill Mountains. Explore the ruins of the incline railway's powerhouse or follow a short trail leading to a 1901 Daughters of the American Revolution monument.